Skeletal figures, too weak to move, wait limply for help. At gunpoint, blank-faced SS officers manhandle the twisted bodies of the prisoners they starved to death, slinging them into gigantic burial pits that will eventually be filled with thousands of corpses. Bullet-riddled bodies and skulls smashed into grotesque shapes line country roads. Having frantically tried to dig his way out of a barn where hundreds were being burned to death, a man’s body lies wedged under a wall where he was shot by German troops. 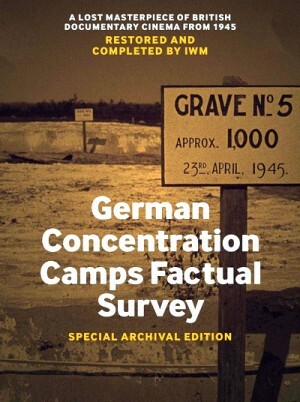 The catalogue of horrors uncovered by the film "German Concentration Camps Factual Survey" is unremitting, but they remained unseen for decades. Produced by Sidney Bernstein for the British Ministry of Information, the film was originally made to document the liberation of the German concentration camps in 1945 and to also provide evidence of the atrocities to the German public. By the time the film was ready for a potential release, there had been a change in the Anglo-German relations and the film was shelved. For a number of years, the film feels languished in the Imperial War Museum and were known only by their archival title number: "F3080". More than half a century after Mr. Bernstein began work on this documentary, it has been at last completed and restored, and is now receiving a commercial release under the exacting, straightforward title “German Concentration Camps Factual Survey”.